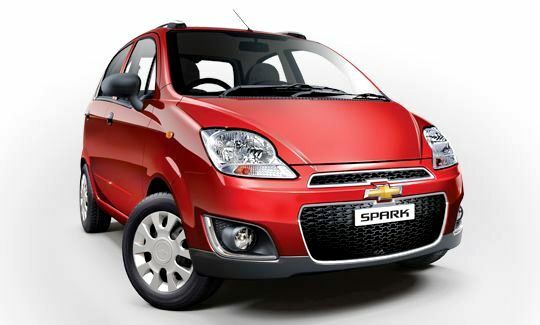 General Motors has launched a facelifted Chevrolet Spark in India in five variants priced between Rs. 3.26 lakh and Rs. 4.10 lakh ex-showroom Delhi. This includes two LPG-petrol dual-fuel variants. Here’s a quick look at the prices, ex-showroom Delhi. The new Chevrolet Spark gets a new front look, keeping in line with the Chevrolet family design language of two grilles separated by a thick bar that carries the Bow-tie logo. The headlamps get a slight change in the form of a different cut for the reflectors and indicators and the front bumper has been redesigned. At the rear, the car gets a new rear bumper design with inset reflectors and the tail-lamps also have been partly modified. In profile, the only visible change is the addition of ski-racks that give the car a slightly sportier look. ON the interiors, there have been minor changes that have been carried out as well. The instrument console remains in the centre of the dash, but gets a new “winged” design. The LT variant has a driver’s airbag, power windows, manually adjustable rearview mirror, USB/Aux-in/CD double-DIN music system and manual air-conditioning. The seat upholstery has been changed to a lighter, more younger looking fabric pattern, although the interiors remain grey and light grey. The dashboard is two-toned (grey and light grey). Just as the earlier Spark, the facelifted variant also is powered by a 1-litre, three-cylinder petrol engine that puts out 63 bhp of power at 5400 rpm and 90 Nm of torque at 4200 rpm with a cable-shift five-speed manual transmission. The car rides on 155/70 R 13 tyres with a ground clearance of 170 mm, slightly better than the Alto 800, Alto K10 and Hyundai Eon, its main competitors. The Spark is not really as fuel efficient as its competition, but it has better high speed manners, being a slightly heavier car. The Spark has a claimed mileage of 18 kmpl. There are two LPG variants which offer about 15 kmpl on LPG. « Why diesel cars give more mileage than petrol cars!